A wonderful recognition for New Citroën Berlingo Van, which won today at the Commercial Vehicles Trade Show of Hanover, the coveted title of: “International Van Of The Year 2019”. This is the second time that Berlingo has received this prize, after it was first awarded in 1997 and after more than 1.5 million vehicles have been sold. This 3rd generation of Berlingo has also been awarded for its remarkable evolutions in terms of comfort and technology, without compromising on functionality. It therefore continues Citroën's long heritage in the van segment, which includes iconic vehicles such as the 2 CV Van, the Acadiane and the C15. True to the Brand’s signature, “Inspired by Pro”, dedicated to Citroën utility vehicles, New Berlingo Van adapts to the needs of all professionals and their uses. It stands out thanks to its unique shape available in 2 Sizes (M and XL), as well as its expertise in terms of comfort and safety, with no less than 20 driving aid technologies and 4 connectivity technologies. As the winner of this prestigious election, New Berlingo Van is already available to order and join the network in the last quarter of 2018. “The Citroën brand is proud to see New Berlingo Van receive the prestigious title of “International Van Of The Year 2019” once again. 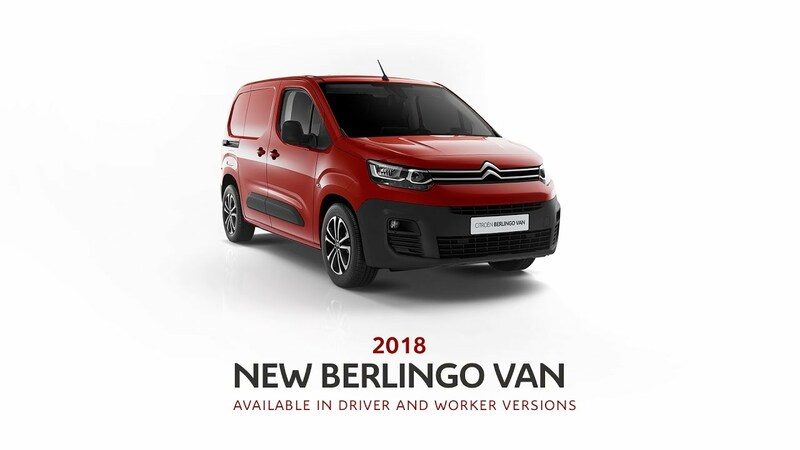 This award bears witness to the leap taken by this 3rd generation of Berlingo in terms of features, and underlines the relevance of Citroën’s offer in the delivery van sector. This success highlights the Brand’s historic attachment to the Light Commercial Vehicle sector, and continues a long success story, from the Acadiane, 2CV Van and C15 or the type H in the past, to New Berlingo Van or Jumpy today. A modern utility vehicle perfect for all uses, it is true to the Brand’s signature “Inspired By Pro”. It is one of the Citroën commercial vehicle range's best sellers and will boost the Brand's light commercial vehicle momentum in Europe; registrations grew by 10.6% in the first half-year, twice as quickly as the rate for the LCV market”. LINDA JACKSON, Citroën’s Brand Director. For the opening of the 67th edition of the Commercial Vehicles Trade Show of Hanover, New Citroën Berlingo was awarded the prestigious title of “International Van Of The Year 2019”. This third generation was congratulated by a jury made up of a panel of 25 journalists and independent magazine editors, specialised in light utility vehicles (LUV). While improving its basics - volume and practicality - New Berlingo Van is attractive thanks to the modernity of its style, its increased comfort, its technologies and its features, worthy of passenger cars. This award on behalf of the members of the IVOTY jury, chaired by Jarlath Sweeney, highlights the pertinence of this offer which has renewed the conventions of the sector. As a reminder, it is the fifth time in the history of this sought-after prize that Citroën has won “International Van Of The Year” and the second time for the utility model Berlingo. Their last victory dates back to 1997, when the very first generation was launched. Other models of the Citroën utility range have also been well-received in the past: Citroën Nemo (in 2009), Citroën Jumpy (in 2008) and Citroën Jumper (in 1994). Already available to order in France from 17,450 Euros excluding taxes, New Berlingo Van will join the network in the last quarter of 2018. Originating from a rich legacy, and a key player in its sector, the Berlingo has always been innovative. Since it was launched in 1996, more than 1.5 million models have been produced throughout the world. A staple model, Berlingo has not aged over the years and its sales increase annually, which is a rare phenomenon on the automotive market. In 2017, it even scored a record year in France, with more than 27,000 registrations, a 4% increase compared to 2016. Berlingo is a real commercial success, with nearly 41,000 new registrations in the first half of 2018 (representing 12% growth), and a 2nd place position within its segment in Europe, making it a key contributor to Citroën's LCV momentum. New Berlingo Van is therefore very important for the Brand. It has a strong legitimacy in the delivery van sector, in which Citroën has always paved the way by offering iconic models like the 2CV Van, the Acadiane or the C15. In Europe, in the first six months of the year, the utility market represented 1 registration in 4 for Citroën, with 110,986 LUV number plates. In LUV, Citroën has grown by 10.6%, i.e. a growth that is more than two times higher than the market (+4.9%). The Brand has improved its LUV market share in Europe by 0.5 points, to reach 9.9%. Citroën has also earned its place in the European brand rankings, and is in the Top 5. In France, this leap is illustrated by an increase of 1.3 points, i.e. the equivalent of 16.2% of market shares. Totally in keeping with the Citroën range’s new look, renewed in less than 2 years, this third generation of utility vehicle marks a real generational leap in terms of design, comfort and technology, and intends to continue along the road to success. -The wheel arch width is the same, compatible with Euro-pallets, and can hold up to 2 Euro-pallets in load length.